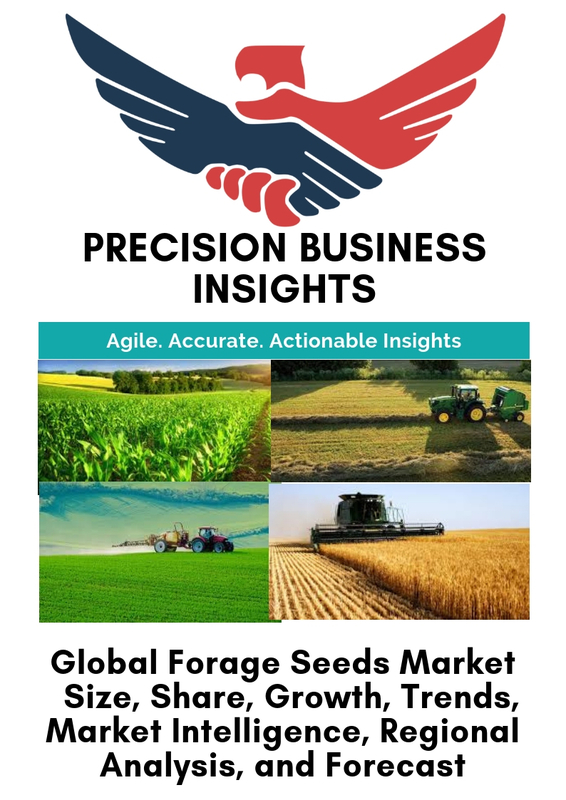 Precision Business Insights (PBI) in its report titled “Forage Seeds Market: Global Market Estimation, Dynamics, Regional Share, Trends, Competitor Analysis 2012-2016 and Forecast 2017-2023” assesses the market performance over eight years forecast period over 2018-2025. The report analyses the market value forecast and provides the strategic insights into the market driving factors, challenges that are hindering the market revenue growth over forecast period. The rise in the demand for livestock products such as beef, pork, other poultry products and milk is anticipated catapult global forage seeds market. In accordance with FAO, bovine production accounted for 66.7 million metric tons in 2010, and it is projected to reach 107.5 million metric tons by 2050. The great enhancement of livestock production leads to increase in the livestock feed sector, which enables the demand for forage seeds in the market. However, cost-effectiveness of the crops coupled with high demand for forage seeds is anticipated to create growth opportunities for the market. And lastly, on the basis of the geographical regions, the global forage seeds market segmented into following regions- North America, Europe, Asia-Pacific, Latin America, and Middle East & Africa. North America is expected to dominate the forage seeds market. U.S. is projected to account for major revenue share in the region due to increased awareness and adoption of cutting-edge technologies in the field of forage seeds market. France is expected to offer lucrative opportunities for the forage seed market. Favorable government policies and availability of grasslands and forage crops in the French landscapes is considered as a benefit for a market. China forage seeds market is expanding at significant growth rate due to increased population creates demand for livestock products in the country. Some of the key market players include La Crosse Seed, Hancock Farm & Seed Co., Allied Seed, LLC, Golden Acre Seeds, AMPAC seed, Dynamic Seeds Ltd., Northstar Seed Ltd., Moore Seed Processors, Foster’s Seed and Feed, Brett young, BASF SE and Dow AgroSciences LLC. Market players majorly focused on the adoption of state-of-art technologies, new product introductions, and strategic partnerships to cater larger market. Some of the market development include La Crosse Seed launches specialized cover crop inoculant in 2016. The LINK inoculant is the dry product that can be applied to seed or at the planter and it is applied to the entire crop mix. What is the current and future forage seeds market outlook worldwide? What trends are affecting the global market? What is the competitive landscape and market share of major players in the forage seeds globally? What are the key, high growth markets that forage seeds manufacturers should expand into? Which market segments are growing the fastest? What are the unmet needs with the forage seeds currently on the market? How will emerging technologies fulfil these unmet needs? What is physician perception and market outlook of forage seeds? What are the challenges and barriers that have hindered widespread adoption of forage seeds?